Welcome to our products page which provides you with a general listing of the main timbers we supply together with a summary of the various options that are available for each – such as sizes, grades and certifications. From random width to fixed width lumber, from boules to beams, from decking to cladding, from laminated blanks to machined profiles, from modified softwood to thermo-treated hardwood, we’ve got it covered. Most of these products can be ordered for prompt delivery from our storage facility near Liverpool. Alternative purchase options include consignment/call off deals or bulk purchases ex quay/ex ship and direct from source. 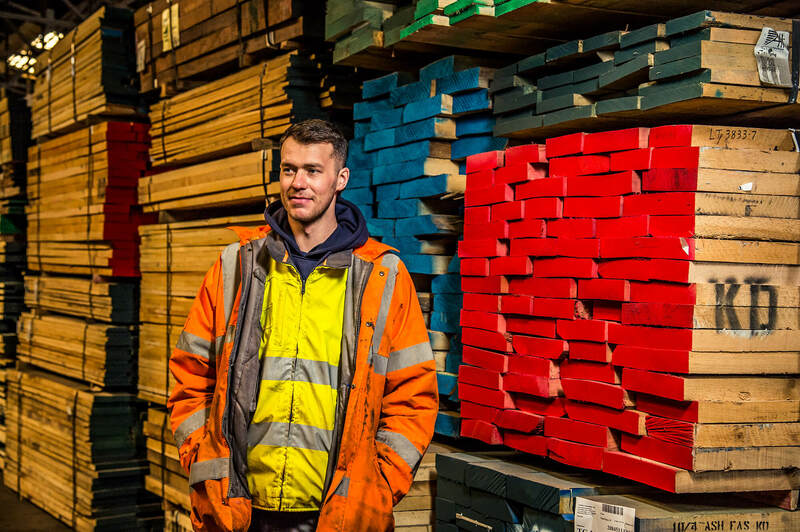 With the largest single stock holding of imported hardwoods and premium grade softwoods in the UK we are the number one supplier to the trade. If you are interested in our latest offers, please look at our offer page or alternatively contact our qualified sales team who will be happy to discuss your specific enquiries. White Oak k/d Superior, Prime Export (FAS/FAS 1F), No.1 Common & Selects, No.2 Com. 3/4" to 4" 6" & wider, 10" & wider, fixed width 8' & longer Northern, Middle and Southern Appalachian FSC Landed stock over 2,000m3. Poplar k/d (Tulipwood) Prime Export (FAS/FAS 1F), colour sorts and paint grade 1" to 4" 6" & wider, 10" & wider, fixed widths 8' & longer Middle and Southern Appalachian FSC Landed stock. Black Walnut k/d Superior, Prime Export (FAS/FAS 1F), FAS/Walnut grade. Steamed 1" to 4" 5" & wider, 10" & wider, 13" and wider 8' & longer Northern and Middle Appalachian FSC Landed stock. Substantial range of product. Ayous k/d FAS 25mm to 50mm 100mm & wider, fixed widths 2.1m & longer, fixed lengths Cameroon FSC Landed stock. Plus laminated/finger jointed blanks 25mm to 100mm 150mm & wider 2.1m & longer Ghana, Ivory Coast FSC Controlled Wood Landed stock. Iroko k/d (Odum) FAS, waney edged boules 25mm to 100mm 150mm & wider, 250mm & wider, fixed widths 2.1m & longer Ghana, Ivory Coast, Rep. of Congo, Cameroon FSC Landed stock. Sapele k/d FAS, square edged boules, plus laminated/finger jointed blanks 25mm to 100mm 150mm & wider, fixed widths, wide boards 2.1m & longer Rep. of Congo, Cameroon, Ghana FSC, VLC/OLB 3rd Party Verified Landed stock. Utile k/d (Sipo) FAS 25mm to 100mm 150mm & wider 2.1m & longer Rep. of Congo, Cameroon, Ghana FSC Landed stock. Wawa k/d FAS 25mm to 50mm plus Coffin Boards. 100mm & wider, fixed widths 2.1m & longer, fixed lengths Ghana FSC Controlled Wood Landed stock. Yellow Balau a/d Standard & Better, decking profiles 21mm/28mm 145mm only 8' & longer Indonesia FSC, SVLK, FLEGT Landed stock. Keruing a/d Standard & Better, plus machined half lap for truck beds 7/8" to 3" 6" only 8' & longer West Malaysia PEFC Landed stock. Dark Red Meranti k/d Select & Better, plus A grade mouldings 1" to 4" 6" and wider, 9" and wider, fixed widths 8' & longer West Malaysia, Indonesia PEFC, SVLK, FLEGT Landed stock of sawn and mouldings. Receive our monthly price guide and offers?